This easy to make Creamy Coconut Lentil Curry is a healthy vegan recipe that makes a perfect Meatless Monday dinner recipe. It takes less than an hour (mostly hands-off time) to make and is packed full of delicious Indian flavors. Make extras and you’ll have a giant smile on your face at lunch the next day. 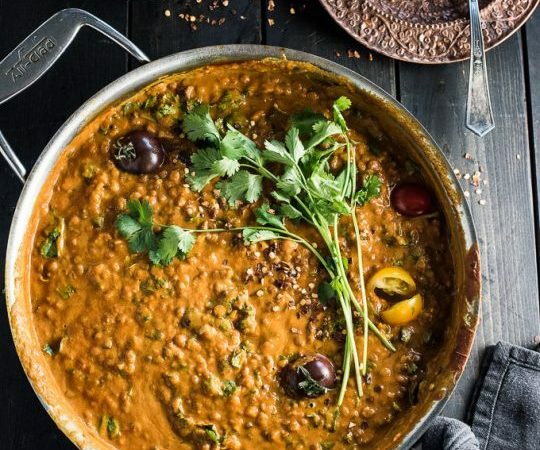 ✨ If you love this Creamy Coconut Lentil Curry as much as I do, make sure to give it a 5-star review in the comments below! Heat the coconut oil in a large pot or skillet over medium-high heat. Add the cumin and coriander seeds and toast until they start to brown, about 45 seconds. Add the garlic to the pot and let it brown, about 2 minutes. Add the can of crushed tomatoes, ginger, turmeric, and sea salt to the pot and cook, stirring the pot a few times, for 5 minutes. Add the lentils and, if using, the cayenne powder, and 3 cups of water to the pot and bring it to a boil. Reduce the heat to low, cover the pot, and let it simmer for 35-40 minutes, or until the lentils are soft. Stir the pot a few times to prevent the lentils from sticking to the bottom. If the curry starts to look dry, add an extra 1/2 – 1 cup of water. Once the lentils are soft, add the coconut milk and cherry tomatoes and bring the pot back to a simmer. Remove the pot from the heat and stir in the cilantro.